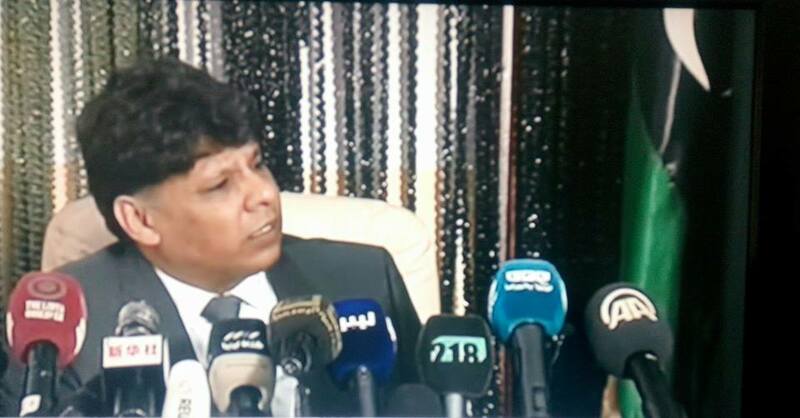 The head of the Investigations Bureau of the Attorney General’s Office Sadek Assour revealed great details about Libya’s investigations into IS terror acts in Libya since 2011 (Photo: Min of Justice). The head of Investigations at the Attorney General’s Office (AG), Sadek Assour, made some very interesting revelations yesterday at an unprecedented and expanded press conference the Court Centre in Tripoli. A 30-plus slide power point show accompanied the presentation showing details and photographs of accused, organizational charts, links and routs of travel into Libya based on 14 months of investigation. While many of the revelations and individuals named were already in public domain, this was the first time they were officially revealed or confirmed by official judicial Libyan authorities. Many of the names revealed at the press conference will be known to experts in the field. Assour said that most of the perpetrators of terror attacks in Libya were now know to the Libyan authorities. Abu Amer al Jazrawi IS commander of Tripoli was killed in battles in Sirte and Abdulhadi Zaroon is one of the important leaders in Sirte and was killed in the battles of 2016. Mahmoud Albarasi, one of the leaders that is still wanted for arrest is currently located in the south of Bani Walid, While Bilal Al Masri served as Court of Justice and Ombudsman Assour explained. Abu Amer al Jazrawi is a Saudi commander of IS in Tripoli and is in charge of assassinations in the western region prior to being killed in Sirte Mahmoud Massoud Albarasi was the commander of IS in Benghazi and detonated a number of security institutions in the city. Mahdi Salem Rajab Dingo was responsible for the staff and military office and is wanted by the security apparatus. Wisam Zubaidi was appointed commander of IS in Libya and was killed in 2015. Hasan Araj was the first to be recruited by IS in Libya and was killed in Sirte in 2016. The Tunisian journalists had been stopped on the road between Derna and Ajdabia and the AG’s Office are withholding the information on the Tunisian journalists’ case for the sake of confidentiality of ongoing investigations. The purpose of the killing of Sheikh Ben Othman was political and it was carried out by IS. Assour revealed that about 800 warrants had been issued for nearly 200 terrorist attacks in Libya. The storming of the US consulate in Benghazi and the death of ambassador Chris Stevens was carried out by Ansar al-Sharia and Al-Zahawi was responsible for the operation. The elements who contributed to the assassination of the American ambassador have revealed all the information relating to the case, Assour claimed. Ansar al-Sharia and al-Qaeda were taking instructions from Zawahiri directly, he added. Assour said that the burial sites of the Egyptian Copts who were slaughtered behind the Mahari hotel have been identified in Sirte and that the AG’s Office had all the information about those responsible for the slaughter. Adding that one of the IS members who had witnessed the incident had supplied all the information. More than 1,000 elements belonging to terrorist organizations are wanted for justice, a large number of whom are wanted in Turkey, Syria and Iraq. More than 700 IS bodies from Sirte are being held in mortuary fridges. IS was responsible for the kidnapping of the Italians in his Sabratha. A Mauritanian was arrested in his Sabratha, who carried out operations against the Algerian army was part of a Hamas cell. Several Arab leaders rotated the command of IS in Libya. There are individuals who participated in the Syrian war and returned to Libya with IS philosophy. Some IS members come from outside Libya to coordinate with the Libyan IS leadership. Investigations of IS prisoners showed results in documented facts against some unknown members. On IS funding, Assour said that IS kidnapped businessmen and made use of the obtained ransom for funding. He added that investigations have fully clarified IS’s sources of support and funding. He said that there were ongoing investigations that could not be revealed due to the need for their utter secrecy. 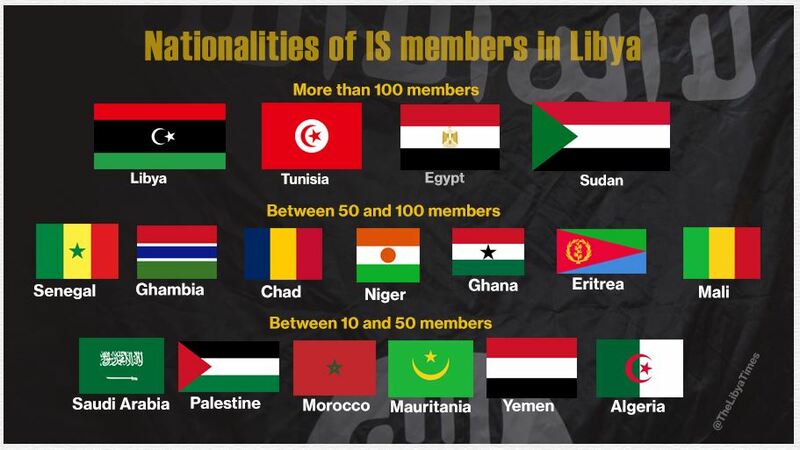 The various nationalities of IS members implicated in terror acts within Libya (Source: AG Office). The Libyan eastern city of Derna (currently under the control of the Derna Mujahidin Shura Council and being sieged by Hafter’s Libyan National Army) was preparing itself to become an emirate like Syria and Iraq, Assour said. There were numerous IS cells operating, including a cell in the city of Misrata, and theis cells was responsible for several explosions in Misrata. 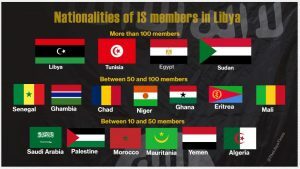 The most nationalities that joined IS were from Tunisia and Egypt and 7 were killed in Sirte who had formed in Egypt. There are still a lot of individuals in the Sudan and Tunisia who are recruiting members. The Libyan Attorney General’s Office will send warrants to the states to which IS members are affiliated, Assour added. The more than 200 suicide bombers and assassinations were identified in all Libyan cities, and we have all the information about them and they will be brought to trial. The Majority of IS leaders in Libya were former al-Qaida members, he revealed. Assour confirmed that IS was responsible for the murder of former Attorney General Abdulaziz al-Hassadi, HoR member Freha al-Barkawi, as well as Hasan Dakam, Sheikh Mohammed bin Othman and the director of the security of Sabartha Hasan Kamuka. Assour also finally gave official confirmation to the fact that Ansar al-Sharia were the nucleus of the formation of IS in Libya and that the financing of the organization emanated from the Libyan state. Most of IS’s funding came via high ranking commanders in Syria and Iraq the hold outs of various Libyan banks including the branches of the Central Bank of Libya in Sirte, Benghazi and Derna. He revealed that the AG’s Office had issued summons for some Libyan officials who had supported some terrorist figures financially, in contravention of the state’s financial law. Among the IS crimes were the attacks on the oil fields and the kidnapping of foreigners. The circumstances of the kidnappings of a lot of foreigners have been revealed. There are currently 250 cases before the courts, Assour revealed. Assour said that intelligence officers have been selected to conduct terrorist investigations efficiently and professionally. There are 75 people who have been found not to have been linked with IS and have therefore been subsequently released. Many of those wanted were presently in Turkey and Syria, he revealed. Besides the 780 IS dead bodies being held in refrigerators, there are hundreds of IS bodies buried under the rubble in Sirte. Many IS members had left Libya for Syria and Iraq known to the AG’s Office by name. He said that the AG’s Office had information about cells trying to activate themselves in Libya, one of which is connected to the Hamas movement. There is cooperation between the AG’s Office Bureau of Investigation and the Libyan Ministry of Foreign Affairs on issues of terrorism and immigration and Tripoli and Benghazi Investigations Bureaux are collecting data on terror cells. Many murders, kidnappings and assassinations in his Sabartha were carried out by extremist groups, Assour confirmed. Assour also revealed that a database of has been created containing all the information on 1,500 IS members.